ERGONOMIC DESIGN: A comfortable contoured seat, two cup holders for drinks or snacks and a detachable blue cape that doubles as a blanket means your Batman fan will enjoy every moment of their ride. SAFE COMFORT: The Combination 5-Point Harness Booster Car Seat is designed with extra polyurethane foam padding, while the 3-position headrest contains EPS Foam that is energy absorbing for impact protection. 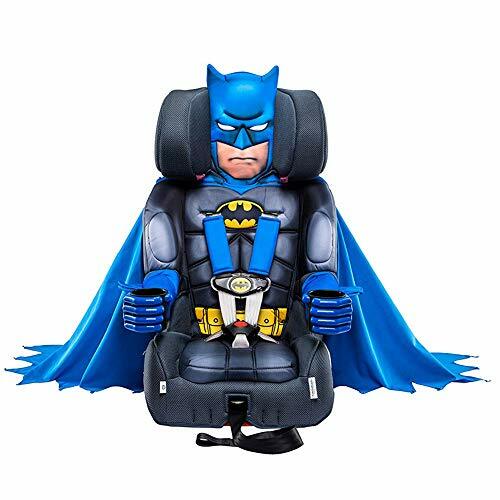 TESTED: Drive safe knowing your Batman Combination Booster Car Seat is a certified "BEST BET BOOSTER" from the Insurance Institute for Highway Safety and exceeds the Federal Motor Vehicle Safety Standards (FMVSS 213)! AGE AND SIZE RECOMMENDATIONS: The Combination Booster Car Seat is meant for children 1 to 10 years old. Use of the 5-Point Harness is meant for children weight 22 to 65lbs., while the high back booster is meant for children weight 30 to 100lbs. GROW SECURELY: The patented 2-position crotch belt easily adjusts to grow with your child, along with seat belt guides located on the adjustable headrest for properly positioning the vehicle shoulder belt.